Thursday 27th April, 7pm &apos;til 9pm, Hop Burns & Black, 38 East Dulwich Road, London SE22 9AX. Tickets £15 Per Person and includes 4 generous pours of beer and a tasty morsel matched with one of the beers. Have you ever wanted to learn more about your favourite beer ingredients and how they make your preferred tasty beverage taste so damn good? Well here’s your chance! 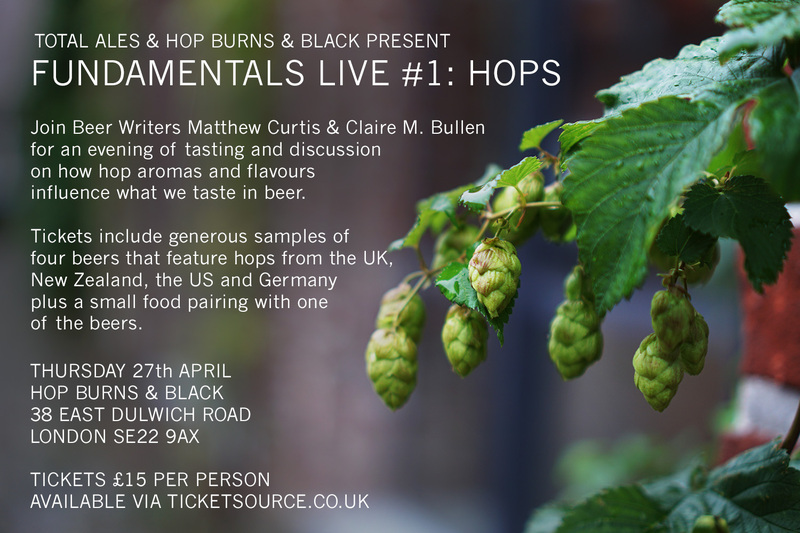 Join beer writers Matthew Curtis and Claire M. Bullen at Peckham’s premier beer, record and hot sauce store, Hop Burns & Black on Thursday April 27th for the first installment of Fundamentals Live: Hops. This new series of events is based on Curtis’ new column for the HB&B blog, which aims to explore in detail the fundamental ingredients of beer – from hops and malt to water, yeast and more. The first in this series of interactive events will focus on everyone’s favourite beer ingredient: hops. Curtis and Bullen will guide guests on a tutored tasting of four beers, each elegantly showcasing hops from four regions: The UK, Germany, The US and New Zealand. Ticket holders will also get a chance to get hands on with some whole leaf and pelletized hops and learn how they impart bitterness, flavour and aroma to your favourite beers. To keep things interesting with each round of beers we’ll introduce a different debate topic. Curtis will aim to prove that British hops are actually brilliant and are capable of producing far more than twiggy brown beer before talking about origins and influence of the original noble hop varieties. Meanwhile, Bullen will wax lyrical about the pungent hops from her native US, before discussing the new world hops of Australia and New Zealand. As Hop Burns & Black’s resident food columnist Bullen will also be providing a small food pairing to demonstrate the way hop flavours can complement some of your favourite dishes. So join us on the 27th of April for what promises to be both an entertaining and educational evening. Tickets are just £15 per person and are available in store at Hop Burns & Black or via Ticketsource by clicking right here. We’ll be announcing the beer list and food pairing right here once they’re confirmed.